Dental caries is a significant public health problem with the 2010 Global Burden of Disease study indicating its affecting around 35 % of the global population. Topical fluoride use is a key element of caries prevention and fluoride gels, typically acidulated phosphate fluoride (APF) gels in the concentration of 12,300 parts per million of fluoride (ppm F) applied biannually are one delivery method. The aim of this review was to determine the effectiveness and safety of fluoride gels in preventing dental caries in the child and adolescent population. Searches were conducted in Cochrane Oral Health Group Trials Register the Cochrane Central Register of Controlled Trials (CENTRAL) Medline, Embase, CINHAL, LILACS, ProQuest Dissertations and Theses, Web of Science Conference Proceedings, ClinicalTrials.gov and the WHO International Clinical Trials Registry Platform. Randomised or quasi-randomised controlled trials (RCTs) with blind outcome assessment, comparing topically applied fluoride gel with placebo or no treatment in children up to 16 years with a minimum application of once a year, and study duration at least one year were considered. The main outcome was caries increment. Study selection, data abstraction and risk of bias assessment was carried out independently by at least 2 reviewers. Standard Cochrane approaches were taken for data analysis. The GRADE approach was taken for overall quality of evidence. 28 studies involving 9140 children and adolescents were included. 20 studies were considered to be at high risk of bias and 8 at unclear risk. Subgroup and metaregression analyses suggested no significant association between estimates of D(M)FS prevented fractions and the prespecified trial characteristics. However, the effect of fluoride gel varied with the type of control group used, with D(M)FS PF on average being higher in non-placebo controlled trials. Only 2 trials (490 participants) reported data on adverse events , but one of these had no events in either arm. The conclusions of this updated review remain the same as those when it was first published. There is moderate quality evidence of a large caries-inhibiting effect of fluoride gel in the permanent dentition. Information concerning the caries-preventive effect of fluoride gel on the primary dentition, which also shows a large effect, is based on low quality evidence from only three placebo-controlled trials. There is little information on adverse effects or on acceptability of treatment. Future trials should include assessment of potential adverse effects. This updated Cochrane review included 3 new trials published since it was first published in 2002. None of the included studies was published after 2005. While the findings of this review clearly demonstrate an important anticaries effect with a 28% reduction, it is increasingly rare to find them used clinically. Typically these gels were applied in trays which were required to be in situ for several minutes and there are concerns regarding over exposure and reports of nausea and vomiting. Consequently, there has been a significant move to fluoride varnish use, which is easier to apply good evidence of a larger caries reduction effect. Marinho VCC, Worthington HV, Walsh T, Chong LY. 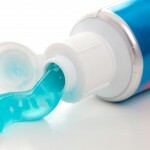 Fluoride gels for preventing dental caries in children and adolescents. Cochrane Database of Systematic Reviews 2015, Issue 6. Art. No. : CD002280. DOI: 10.1002/14651858.CD002280.pub2.